Proteins are one of the most important kinds of molecules necessary for life as we know it. Proteins perform a staggering amount of function in the body: forming physical structures, catalyzing metabolic reactions, transporting molecules, signaling between cells, and more. It is estimated that the human body contains 50,000-100,000 different kinds of proteins, each of which is specialized to serve some function. The basic building blocks of proteins are called amino acids. In proteins, amino acids are arranged into a linear molecule called a polypeptide chain. Some proteins only consist of a single polypeptide chain while more complex proteins are made out of multiple polypeptide chains bonded together. The order of amino acids and the 3-D geometry of a protein determine its function. The structure of proteins is encoded in the form of DNA. The order of amino acids in the polypeptide chain is specified by the sequence of nucleotide bases in DNA. All in all, human DNA codes for 20 different amino acids. During transcription, information in DNA is copied into the form of mRNA. During translation ribosomes and tRNA construct the protein from information stored in mRNA. Transcription and translation are the 2 parts of the overall process of gene expression. Amino acids are organic compounds that are composed mainly of hydrogen, carbon, oxygen, and nitrogen. All amino acids contain both an amine (NH2) and carboxyl (COOH) functional group. The central carbon atom (the one to the left of the carboxyl group) is the backbone of the amino acid and is denoted the α-carbon (“alpha” carbon). All amino acids containing an amino group bonded directly to the alpha carbon are called alpha amino acids. The majority of amino acids encoded in DNA are alpha amino acids. Amino acids can also be classified based on their chirality. All amino acids encoded in human DNA can exist in two kinds of isomers, called L-amino acids and D-amino acids. All proteins produced by the ribosomes during translation are L-amino acids while D-amino acids are made during post-translation modification. There are 9 amino acids that the body needs but cannot synthesize. These “essential” amino acids must be gained from food sources. The 9 essential amino acids are phenylalanine, valine, threonine, tryptophan, methionine, leucine, isoleucine, lysine, and histidine. How Do Amino Acids Make Up Proteins? Proteins, at their simplest, are just long chains of amino acids. Each protein is characterized by its specific sequence of amino acids. Two amino acids join together via a chemical bond between the carboxyl group of one and the amino group of another. These kinds of amine-carboxyl bonds are called peptide bonds. So proteins are polypeptide chains that are made out of amino acids that share peptide bonds. The particular order of amino acids in the polypeptide chain is not the only thing that goes into a protein. The proper functioning of proteins is also dependent on the 3-dimensional geometry of the polypeptide strand. The overall structure of a protein can be divided into three levels, the primary, secondary, and tertiary structures. The primary structure of a protein simply refers to its exact amino acid sequence. The order in which one reads a polypeptide chain is from the amine end of the first amino acid to the carboxyl end of the last amino acid. 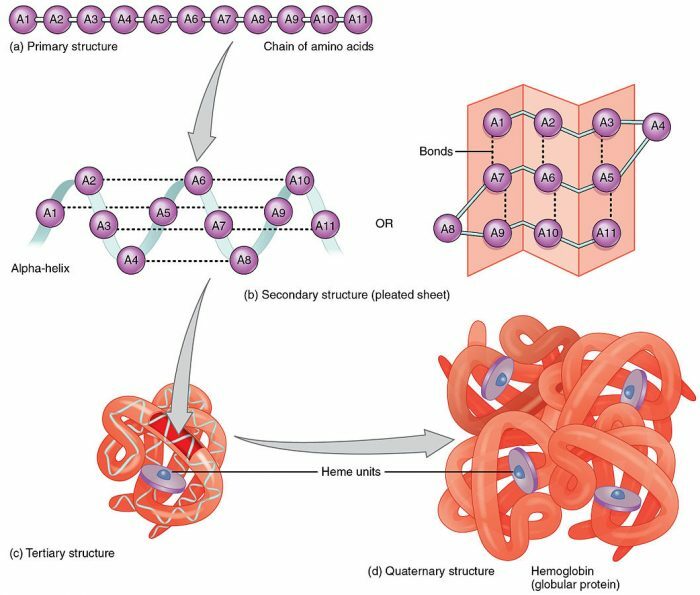 For example, in the above picture of hemoglobin, the primary structure is the basic order of the amino acids in the chain. The secondary structure refers to the pattern of intermolecular bonds between different amino acids on the chain. 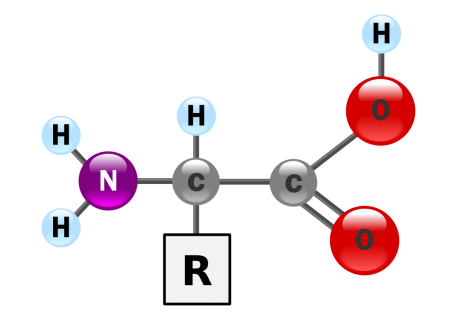 Amino acids attract each other via hydrogen bonds which changes the local structure of the chain. The tertiary structure refers to the overall orientation of the chain in 3-D space. 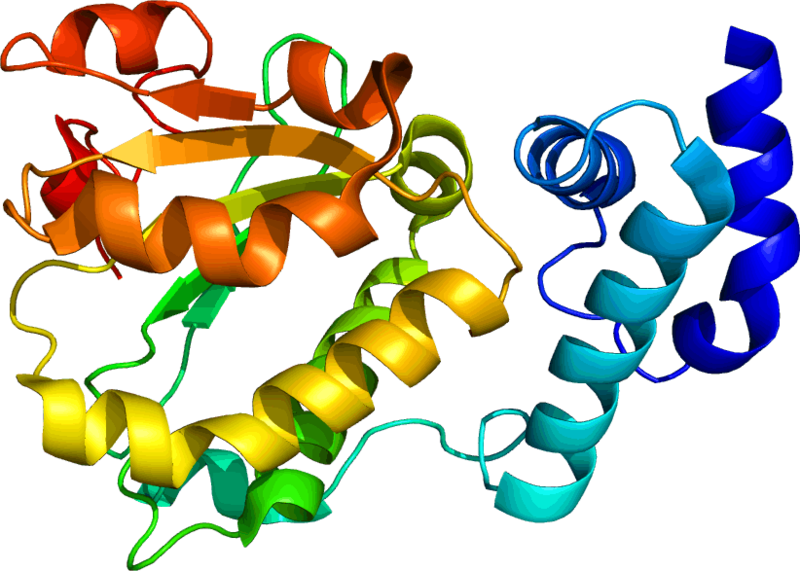 Most proteins have a complex tertiary structure involving numerous folds and compartments. The general functioning of a protein is mostly determined by its tertiary structure. Sometimes, researchers use the term quaternary structure to refer to the arrangement of multiple proteins into a single protein complex. Most proteins are not entirely rigid and may change their tertiary and quaternary structures over their lifetime. In general though, changes to the tertiary and quaternary structures results in a nonfunctional protein. For example, sickle cell anemia is caused by the improper folding of one of the polypeptide chains that make up hemoglobin. Mutations in the HBB gene causes the glutamic acid in the 6th spot on the chain to be replaced with valine. This one change in the amino acid sequence causes the polypeptide chain to fold improperly, which distorts red blood cells into the crescent moon shape associated with sickle cell anemia. As a result, these blood cells cannot carry oxygen efficiently. For a particularly drastic example of the importance of the tertiary structure of proteins, consider the case of prions. Prions are essentially proteins that have misfolded and no longer perform their normal function. Prions are particularly nasty because they can actually “infect” other proteins and cause them to fold improperly as well. Prions are the cause of a number of neurodegenerative diseases, including the infamous “mad cow” disease (bovine spongiform encephalitis). As of now, nobody really knows what causes prions to form, but it is understood that their infectious properties derive from their misfolded tertiary structure. A simple change to a protein’s tertiary structure can turn a normal functioning molecule into a killer infectious agent. How Are Amino Acids Encoded In DNA? Proteins are constructed according to the sequence of amino acids encoded in DNA. 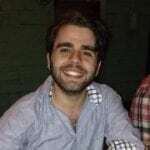 How exactly does DNA encode for a specific sequence of amino acids? 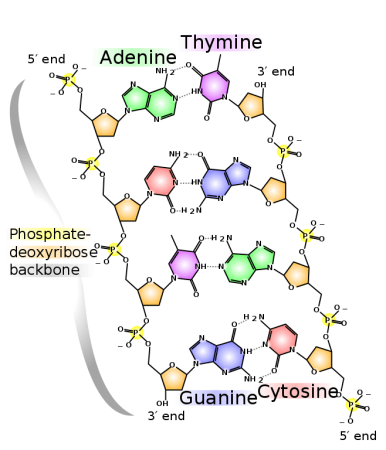 The order of amino acids for a protein is stored in the sequence of nucleotide bases in DNA. DNA contains 4 kinds of nitrogenous bases, A, C, G, and T. A single strand of DNA is read three bases at a time, called codons. Each codon triplet corresponds to a particular amino acid. During transcription, this information is copied into mRNA via complementary base pairing. Once mRNa has been transcribed, it is shuttled to the ribosomes. The ribosomes read the information stored in the codons of the mRNA strand and put together the polypeptide chain according to the order of the codons. In addition to the codons that encode for amino acids, there are 3 special codons called stop codons that signal the end of the polypeptide chain. When a stop codon is read, proteins called release factors disconnect the polypeptide chain from the ribosomal subunits. In prokaryotes, the protein is ready to go. In eukaryotes, most proteins require some extra post-translational modifications before they are ready to do their job. The exact order of nucleotide bases in DNA determines the identity of the protein. This is why changes to sequences of DNA can cause the production of non-functional proteins. A change in the sequence of amino acids changes the identity of the protein, which can lead to the production of “nonsense” proteins that are a random mismatch of amino acids. Further, errors in the translation and post-translation process can result in non-functional proteins. Aside from building proteins, amino acids perform a diverse array of function in the body, specifically in the metabolism and synthesis of neurotransmitters. The amino acid tryptophan, for example, is a crucial ingredient in the reaction that produces serotonin. Likewise, the amino acid glutamate is a precursor to gamma-Aminobutyric acid, an important neurotransmitter involved in the regulation of synaptic activity in the brain. Other amino acids function as messenger atoms in feedback mechanisms and some assist with nerve conduction. Sometimes, the body burns amino acids as an energy source, particularly when glucose levels are low. To sum up, amino acids are the basic building blocks of proteins. Amino acids consist of a central carbon atom(s) with an amine group on one side and a carboxyl group on another side. Proteins are formed out of long linear molecules of amino acids called polypeptide chains. The identity and function of a protein are determined by its sequence of amino acids and the 3-D structure of its polypeptide chains. Amino acids are stored in DNA in the form of sequences of nucleotide bases. During gene expression, information in DNA is copied into the form of mRNA, which is then fed through ribosomes which construct the encoded protein. Amino acids also play a role in a number of functions in the body, including biosynthesis, nerve conduction, and cell signaling.